A few years ago I was doing a routine in my show using a piece of rope, scissors and music. It was what magician's call 'Cutting a rope and making it whole again', but this version is more than that. Anyway, it always received a decent reaction, though not the killer reaction that I expected. So I pulled it from the show and haven't done it since. Several days ago I happened upon a video of a fairly well known magician doing the same effect. And lo and behold, he was doing it silently to music as was mine. In fact, his routine was so close to mine it was uncanny. But there was a difference, he killed with it! My evaluation quickly started. Why one, not the other? I watched his video several more times. Then I dug up a video of my performance. I was surprised to see that though our style of music was similar, the rest of the routine though similar was not the same. I had veered from the normal way of doing the trick whereas this magician had stuck to the template. And don't get me wrong, the template is strong! He had plenty of his own touches which made it unique. But then again, so did I. Yet his routine brought the house down, mine received pleasant applause. Then it occurred to me. The difference wasn't in the routine, it was in the audience! Watching the video confirmed this. The video was shot at my Underground Magic Theatre and this run was all summer camps shows. The audiences were mainly kids. Watching the video, I could hear big reaction from adults, but only average reaction from the kids. Ah ha! I recall watching the video years ago and thinking, "I know this is a strong routine, but it's not playing the way it should". Viewing it, I was to engrossed in the magic, the routining and the staging and neglected the other factor, the audience. It wasn't that the effect was over their heads, it was just something that didn't appeal to them as much as floating a person, sawing someone in half or causing people to appear or vanish. And the one big mistake I made was pulling the routine before it got to a broader aged audience. Lesson learned. And the great news is I have a new routine to add to the Steampunk Illusionist show. A rope trick fits in perfectly. I've already come up with the 'steampunk' touches to make it fit into the show better. I'm so looking forward to using this again and having it get the reaction it deserves! By the way, the photo at the top of the page is NOT the trick from the article. 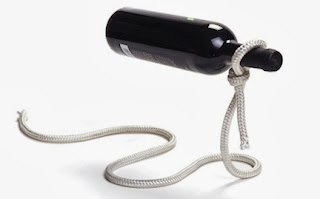 It is a wine bottle holder which can be purchased online. I thought the image was cool, as I didn't have a picture for my routine.